Crosshair sign icon. target aim symbol. gradient buttons with flat icon. speech bubble sign. vector. Crosshair Sign Icon. Target Aim Symbol. Crosshair Target sign. Flat style icon vector illustration. 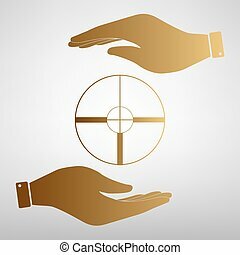 Crosshair Target sign. Paper style icon with shadow on gray. Crosshair Target sign. Save or protect symbol by hands. Golden Effect. Crosshair sign icon. Target aim symbol. Mobile payments, calendar and wifi icons. Bus shuttle.